I got interested in the LPVO’s recently after having some time with the Mercon Mk1 1-6x and a Steiner PX4i 1-4x. I wondered just how accurate these online reviews were, since my experience with the former seemed to drastically differ from a paid reviewer (surprise surprise), so I wanted to see how it compared to something in the sub $5-600 range. 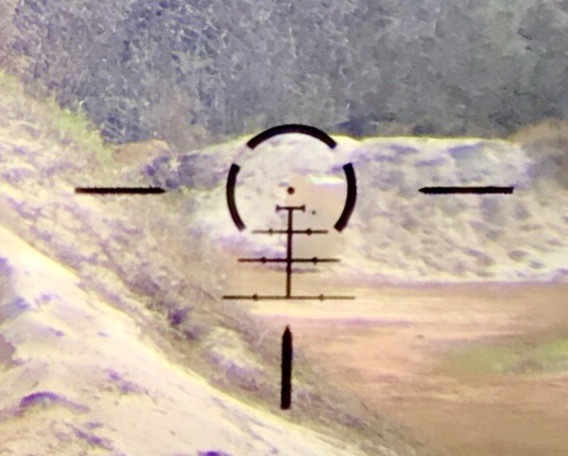 Side note, the Mercon was VERY clear from 3-6x and was very similar to the Vortex Razor HD II in terms of the large wall-to-wall sight picture at 6x. My other gripes were too glaring for me to trade off the bad for the good. Moving on, the Strike Eagle (16.5oz) is just under the upper end of the weight range I feel is ideal. 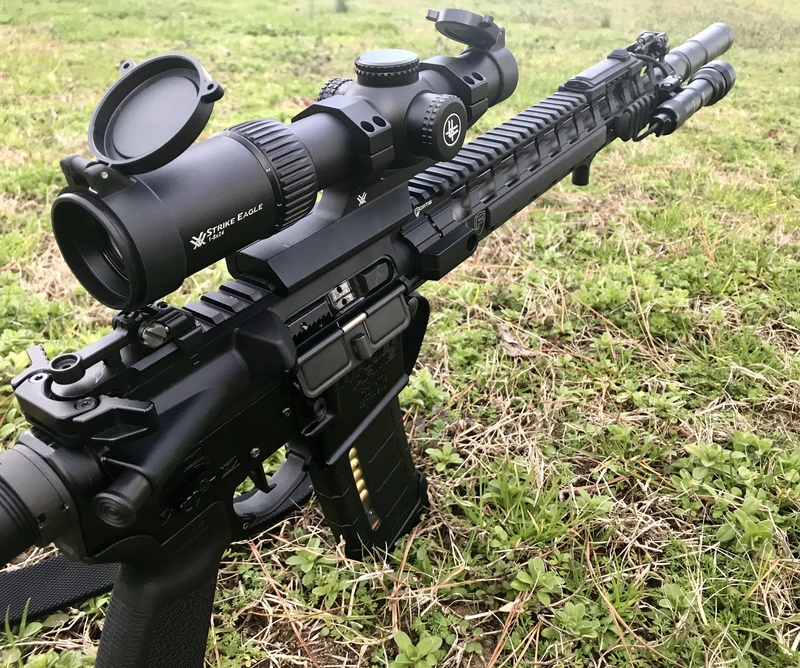 With the Vortex SPR mount (6.7oz), 23.2oz is fairly hefty for the type of rifle I envision this optic on. The Aero Precision Mount is right around 3oz and is a lighter weight alternative, getting in under my high water mark of 20oz. You can see the little slot on the elevation turret at the 10 position. This is for a screwdriver to rotate the number dial around to match the 0 with the reference mark on the threads. This is a simple solution and I have to say, it’s a little awkward to perform. I like Vortex’s spring loaded “lift to disengage” return to zero turrets like on the Viper 6.5-20x platform. 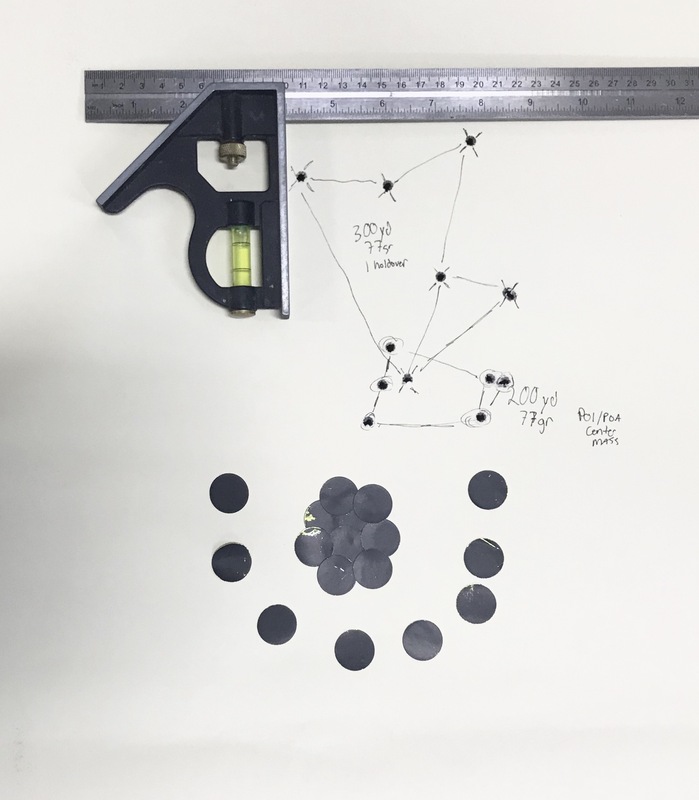 I wanted to use off the shelf ammo with this review so my handloads wouldn’t skew the results. 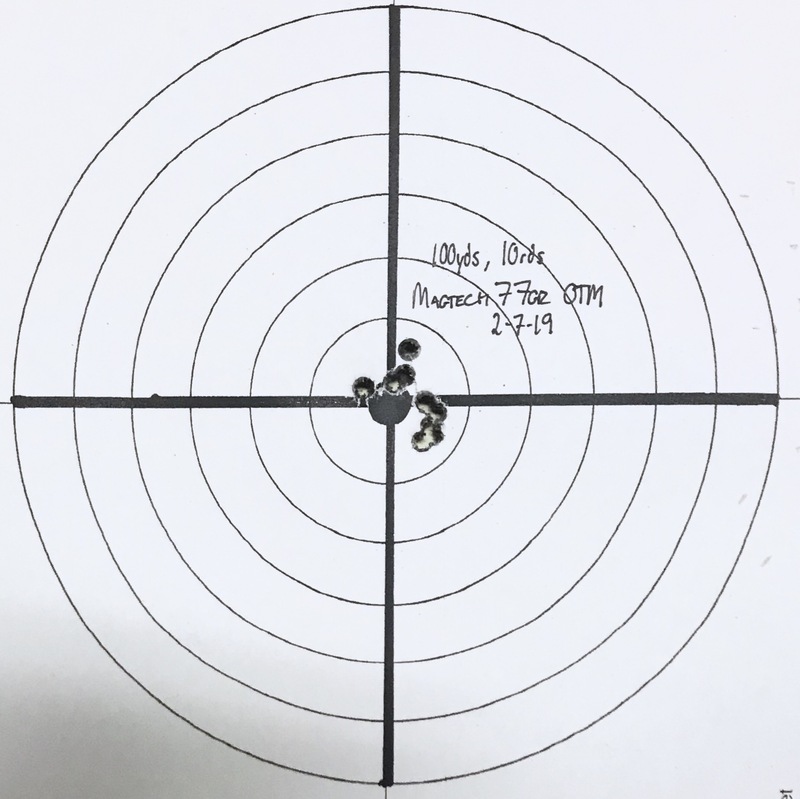 I first zeroed it at 100 yards for the benchmark test then zeroed at 50yds because the manual had a 50/200yd zero with a 1st holdover drop for 300yds. 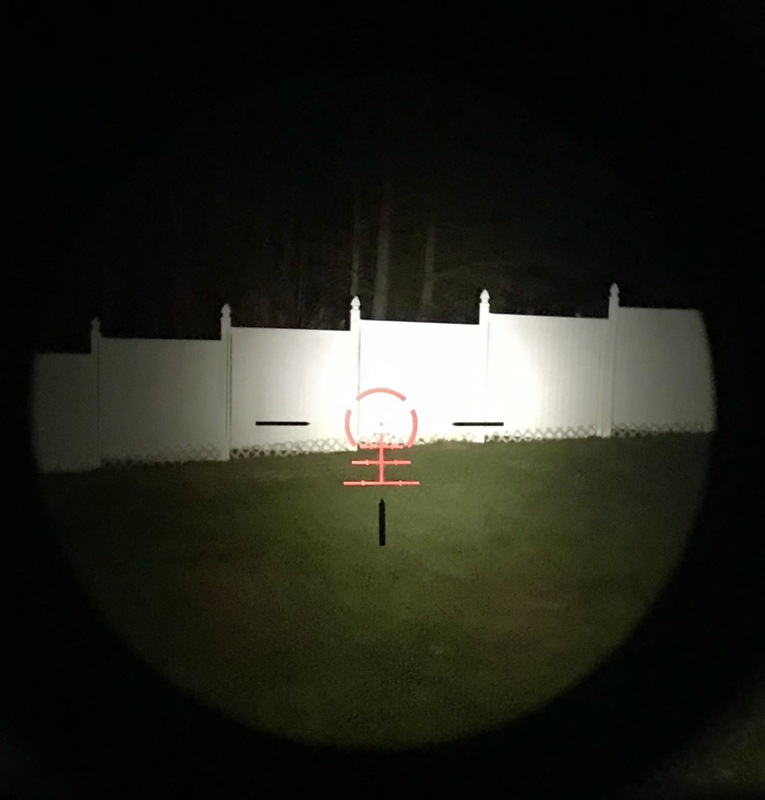 At 100 yards, the center dot is still a decent size that it’s not blocking the target. Your POA is easily repeated. Based on the first photo, I’ll bring up the illumination. Vortex claims 150 hours of battery life but doesn’t specify at what strength, from 1 to 11. Once again, illumination on this LPVO was an issue. Even at 11, in full sun, it was enough to give you some contrast from the target but it wasn’t enough. The low settings 1&2 were pretty useless even in the dark of night. There was a small amount of distortion/light bending on 1x, but not nearly as significant as I was expecting. I have experienced more distortion on higher priced LPVO’s without a doubt. 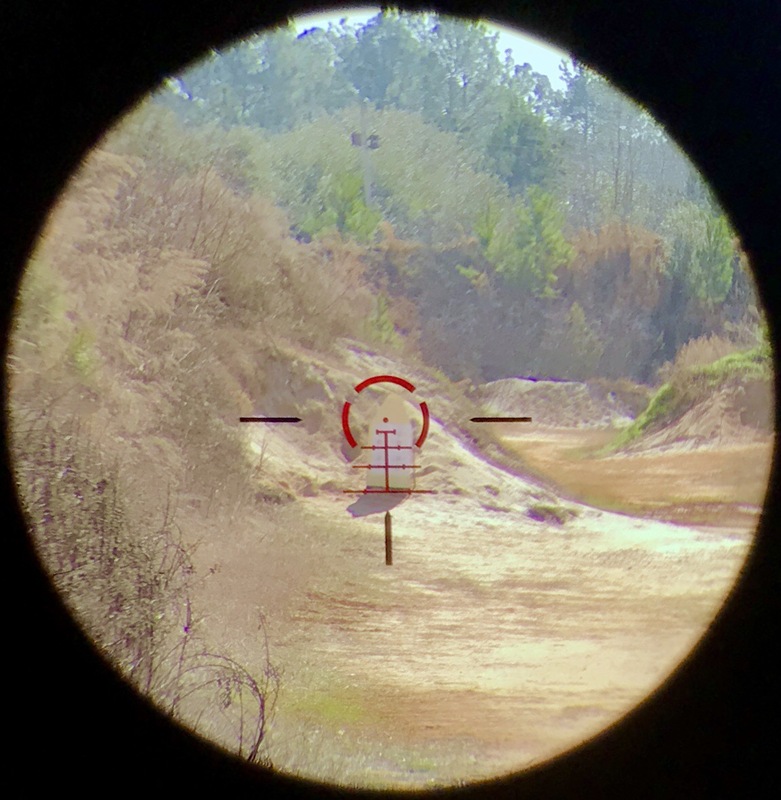 The “ring” in the optic coupled with the 4 MOA dot make a decent quick kill reticle for close quarters work but the body of the scope that projects around the ocular lens can obstruct the shooters view. I found it best to use both eyes open to mitigate that, but not everyone based on their vision can do this. It doesn’t have a raised bump or integrated throw lever, and it really needs an aftermarket one, if only to help with quick adjustments without having to look. 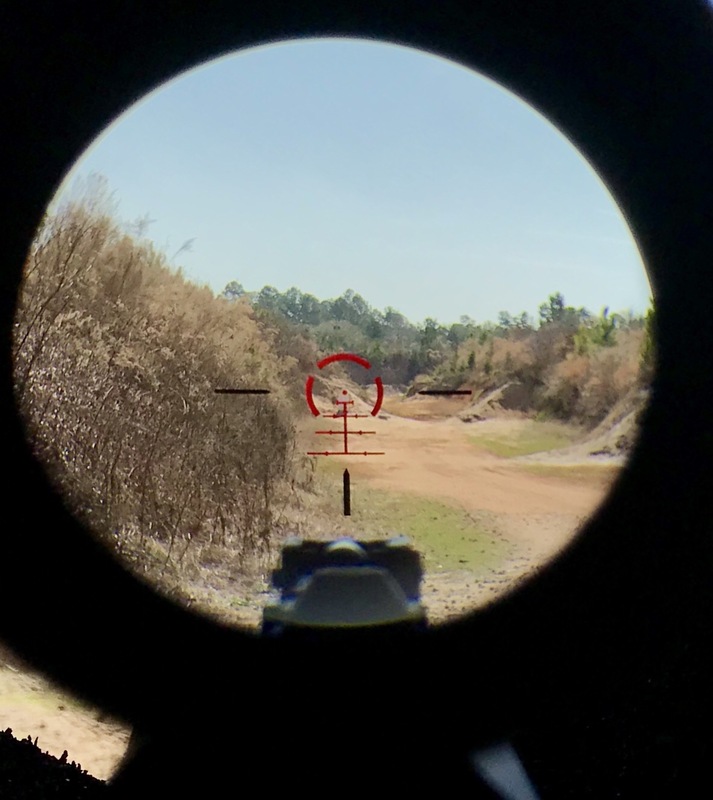 The BDC2 reticle in the scope is designed for use with 77gr bullets. It also says the 50/200 zero is ideal and the hash marks will translate to the prescribed yardage. I rezeroed at 50 yards and moved a target to 200yds and aimed directly at a POA reference made from target pasters. Two things became apparent. 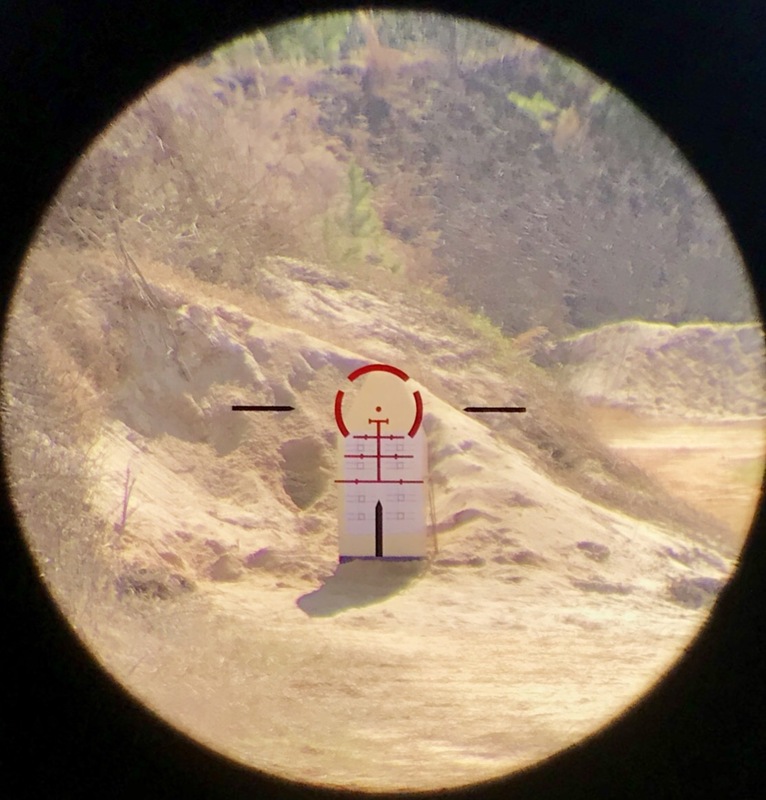 At 200yds, the reticle is now too large for precise shooting. I fired two three round groups, with a brief pause due to a gust of wind really rocking the paper. The groups were high by about 2”. The wind pushed my second group a tad but all in all, I was pleased with my shooting. I repeated the previous paragraph at 300 yards. This was tricky. 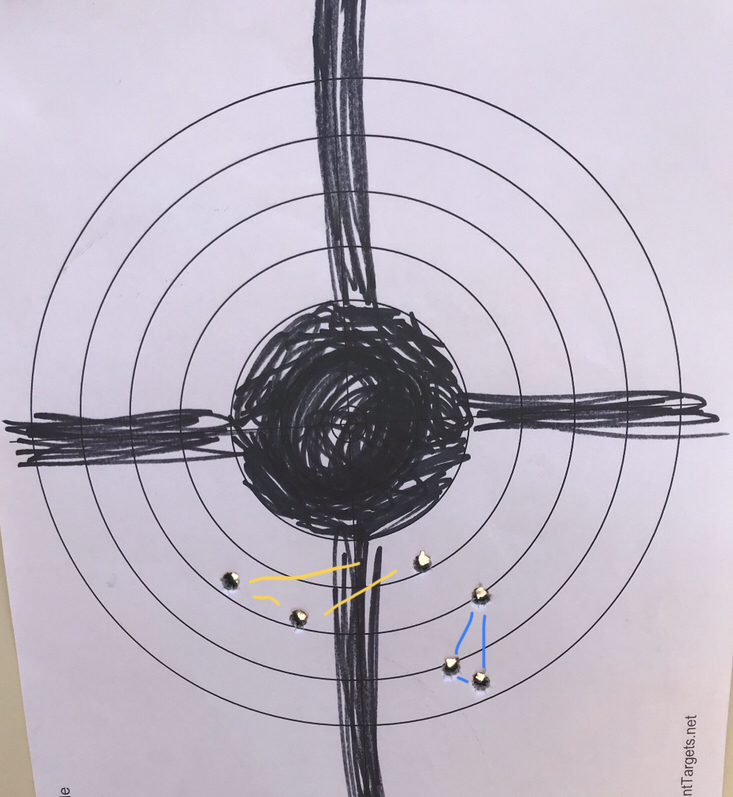 As you can see, the center dot in the reticle and the crosshairs are substantially larger than the POA reference. Based on the manual, with the 50/200 zero, the first stadia line should be on the money. I knew center POA/POI ended up high at 200, but I wanted to do it by the book and not the Kentucky method. My ammo could be moving faster than that which was used for the scope’s calibration but I’m leaning more towards my next guess. I wanted to do some night testing to see what worked and what didn’t. I read about the 1-6x Strike Eagle having some light spill out the front in the dark when on Setting 11... well, setting 11 in the dark would be blinding from the shooters perspective, and I think they added something on the inside to help mitigate light emitting from the front on the eight power model, because I could see the light when I put my eye close to the objective and made a point to seek it out, but otherwise it was on par with other large illuminated reticles I’ve used. This is a solid scope that’s backed by Vortex’s standard lifetime warranty. The intended user is someone who’s on a budget, and I don’t mean that negatively at all, or someone who wants a capable scope who isn’t living the Razor HD 2 lifestyle. For the price point, with a scope that isn’t cheaply made has to have a sacrifice somewhere and getting that extra bit of magnification in there, the clarity of the image does suffer. I’m not saying avoid the scope, but be aware when you are considering it and see if that’s an acceptable compromise. 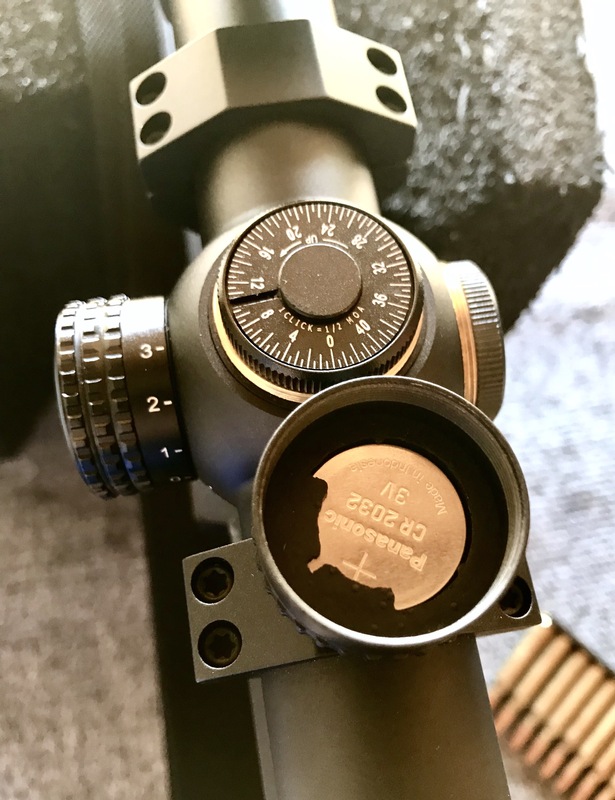 These scopes do go on sale, and as of this posting was available online with a mount for $280. I believe at that price point what you get IS a good value, and I would feel fine recommending the purchase then. But for $500...I don’t think I could tell someone on the fence about it to make the buy. A higher quality 1-4 at the same price would be the better buy despite the lesser magnification. Nice write up. Any plans to take it out further than 100? Nice write up former11b. That took some time. So I seen palmetto blowing these out for 280 shipped for scope and vortex mount.. is it worth it for that amount of money vs 400 normally? Ya psa just blew them out for 280 shipped with their mount..
300 yds with CBC 77gr ammo. Only had a few rounds left from my initial box so I wanted to retest at distance with it. Last time I was shooting a high. 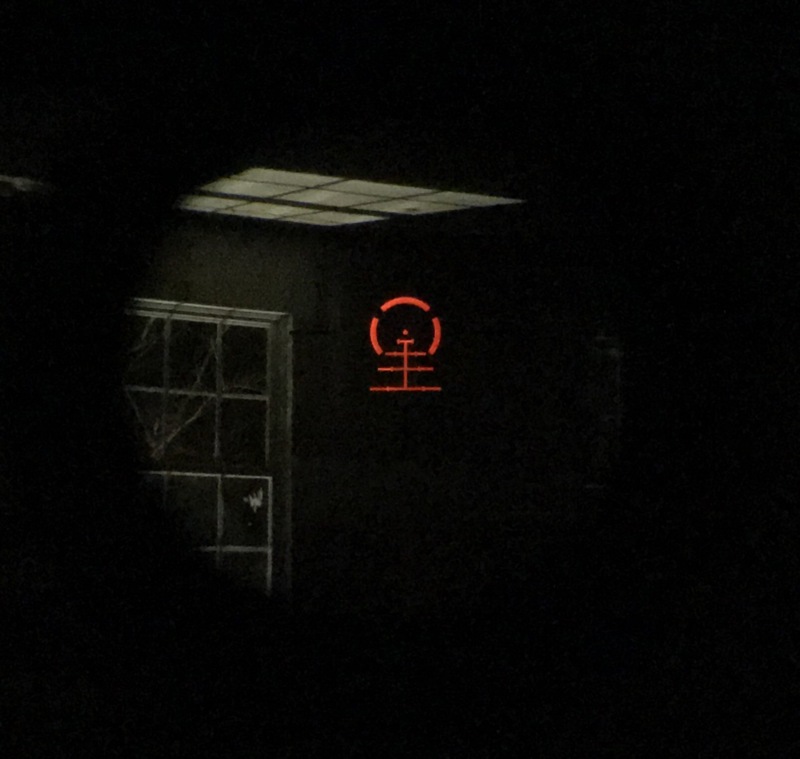 My POA was too small for the reticle, so I was basically guessing where the dot was in relation to dead center of the holdover. This time I drew a much larger circle and was just a couple inches low. Well....it does exactly what it says it will.